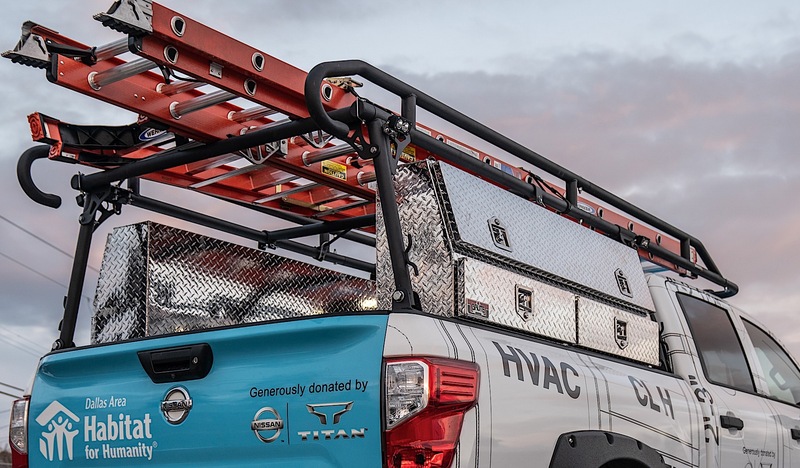 Nissan debuted its new, one-off service vehicle it created for Habitat for Humanity ahead of The Work Truck Show in Indianapolis, Indiana. Called the Ultimate Work Titan, the truck is designed to be a sort of dream accessory for folks who build houses for those in need. The Ultimate Work Titan began in life as a Titan XD Midnight Edition Crew Cab with the 5.0-liter Cummins turbodiesel engine. That Indiana-built motor makes 310 horsepower and 555 pound-feet of torque, and four-wheel drive is on hand to handle the off-road duties. 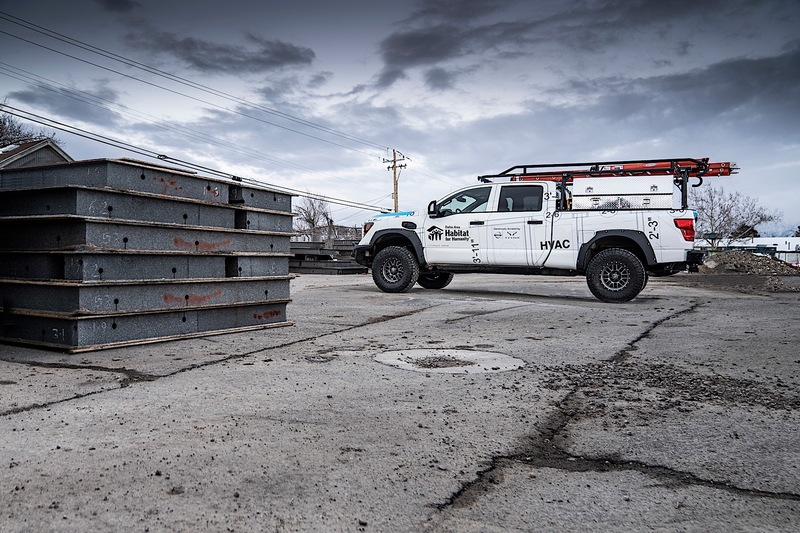 Allowing the truck access remote construction sites is an Icon 3-inch lift kit with adjustable height coilovers. It's the same setup that you, yes you, can order on your new truck directly from the dealership and have covered under the 5-year or 100,000-mile bumper-to-bumper warranty Nissan offers. Special upgrades include Icon Rebound alloy wheels, Addictive Desert Designs bumpers, and a Warn Zeon 12-S winch that helps keep the truck out of harm's way. Baja Designs lighting helps folks get the job done by allowing them to see late into the night. “Construction site supervisors made it clear to us what was needed to make their jobs more productive, and after incorporating their feedback, one thing has become clear: this is the truck for TITANs of the Neighborhood,” said Fred DePerez, vice president, North America LCV Business Unit. To facilitate that work inside the cabin, there's a 13-inch laptop and a printer installed. A custom mobile office takes up the back seat area, with a full desk and a file storage system. Sadly, no fax machine. A Decked lockable storage system sits in the bed, secured by Titan's Utili-track Bed Channel System, and a Bedslide 2000 Heavy Duty helps keep it all together. A full tool kit, including everything a contractor would need to build a house, is also on board. There are even Rigid brand extension cords to deliver the juice wherever it's necessary. 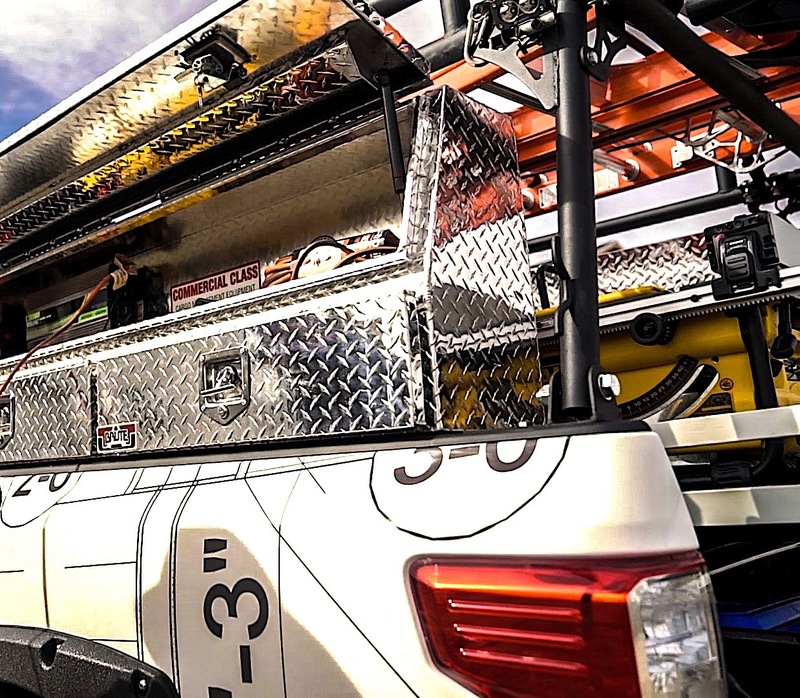 Lastly, the truck features a TrailFX aluminum ladder rack and is stocked with several different sizes of commercial grade ladders. The Nissan Ultimate Work Titan will be on display at The Work Truck Show at the Indianapolis Convention Center before being handed over to the kind folks at Habitat for Humanity, where it will begin its new life as a real work truck. Nissan's $60,000 pickup just can't compete with its American rivals.